Make a donation. Download our form. Be a volunteer. Download our form. 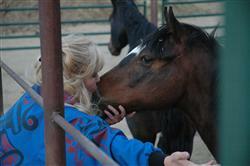 Board Your Horse - For $300 a month, your horse will enjoy a 12 x 12 stall with an outdoor run. The cost Includes feed 2 times a day. Horses are out in the pasture during the day and in the stall at night. You and your horse have access to a large indoor arena year round. Call the Rescue for more information. Troublesome Horse Rescue and Rehabilitation, Inc.
Come for a visit (link to Mapquest ) If you would like to visit our Rescue, please contact us to make an appointment. 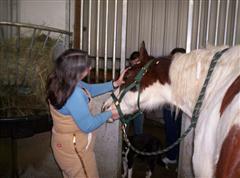 The Troublesome Horse Rescue always has a few items that are needed to help with our riding programs and the horses. • Articles to sell at the Fundraisers - we particularly like homemade items as they sell really well! Monetary donations are always welcome to help with feed and Veterinary costs.